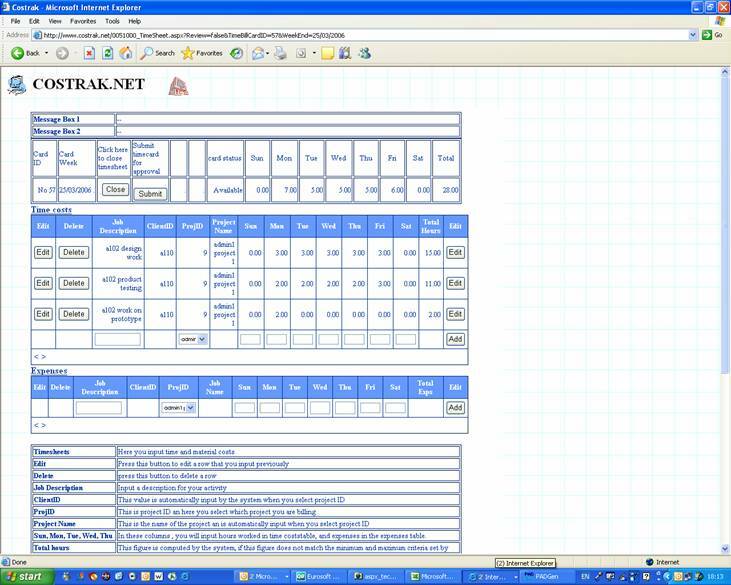 This is a web based Timesheet application for tracking Time & material costs. It is ideal for professionals who bill out their time and material costs to their clients.Using TAM, you can record all the working hours and costs incurred . Timesheets Lite - Timesheets Lite is a piece of software written for companies that cost their employees time on an hourly basis. Timesheets MTS - Timesheets MTS is a low cost multi-user time, materials, and travel billing and logging tool. It is ideally suited to accountancy firms, consultants, or contractors that provide services to companies and bill their time and expenses. TimeClick - Log your times spent on each project by clicking on the project name on a menu within your Windows System Tray. Drastically reduces time spent on updating timesheets. Project Monitor - Designed for anyone working on a time-for-money basis, Project Monitor is an easy to use time-tracking and analysis application. DevPlanner - Convenient tool for managing tasks and planning daily activities. Automatically generates accurate timesheets, weekly and project reports. Generates mood map as colors.